When you live with a missing tooth, your daily life has its challenges. It’s hard to enjoy the same foods you’ve always loved when you can’t properly chew your food. You may feel embarrassed or self-conscious about the appearance of your teeth when you smile or talk to others. A missing tooth may even affect the way you talk. All of these things may leave you feeling pretty hopeless about your situation, however we have good news for you. Oshkosh and Ripon dental implants are a great option for replacing missing teeth and may be the solution you’re seeking. 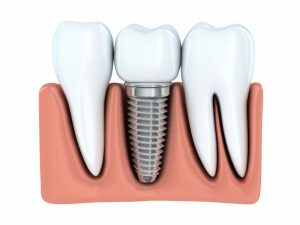 Dental implants are a very reliable treatment, as they boast a 95% success rate. The secret to their success lies in the fact that they replace both your tooth and your root. A titanium post is surgically placed in your jawbone to take the place of your root, while a high quality porcelain crown replaces your lost tooth. At Silver Creek Dentistry, Dr. Johnson and Dr. Hamman utilize guided implant surgery for more accurate and precise implant placement. Using 3D technology, they will create a surgical guide that will help them place your implant on the day of surgery in the exact position that they plan ahead of time. Guided implant surgery takes the guesswork out of implant placement, guaranteeing success for almost every case. If you’re missing one or more of your teeth, a dental implant is by far the best investment you can make in your oral health and your smile because it protects the integrity of your jawbone and your remaining teeth. By replacing your root, your jawbone remains healthy and stimulated, while replacing your tooth keeps your remaining teeth from shifting into the open space. Dental implants are both functional and durable. You’ll be able to eat, smile, talk, chew, brush, and floss as you did with your natural tooth. With excellent home care and regular check ups with your dental provider your implant has the potential to last a lifetime. Not to mention the freedom and confidence you’ll feel about smiling once again! In order to be successful, dental implants do require that the patient be in good overall health and have enough healthy bone structure for support. Dr. Johnson and Dr. Hamman will determine if implants are right for your needs with a thorough examination and x-rays. Most people are good candidates for dental implants near Oshkosh and Ripon and your dentist can review the requirements and options with you. At Silver Creek Dentistry, we’re proud to be able to offer comprehensive implant care to our patients. This means that we can complete your implant treatment from start to finish in the comfort of our own office instead of having to refer you elsewhere for care. Don’t let missing teeth hold you back from the life you deserve! Contact our office today to learn more about implant dentistry and how we can help restore your smile.